U.S. adult shirt sizes: SMALL, MEDIUM, LARGE, EXTRA-LARGE, 2X LARGE and 3X LARGE. 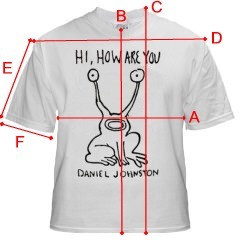 Shirts sold from Daniel Johnston web stores are all 100% pre-shrunk cotton unless otherwise noted. The regular t-shirts are heavy (6.5 oz) t-shirts. The brands vary, but include Gildan, Jersee, Hanes, and others. The colored-sleeve jerseys are 100% cotton. The McSquirt clothing (woman's and children's) are also 100% cotton. REGULAR T-Shirt sizes - sizing varies slightly by manufacturer. Our measurements of the shirts lying FLAT are shown below. Lay your best-fitting t-shirt flat and compare these measurements to find your best size. X-Large 23 '' 26 '' 29.5 '' 23 '' 7.5 " 7.5 "